Food Security, Poverty and Nutrition Analysis provides essential insights into the evaluative techniques necessary for creating appropriate and effective policies and programs to address these worldwide issues. 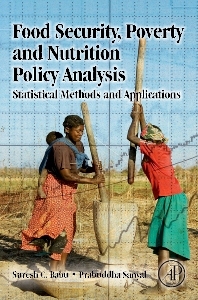 Food scientists and nutritionists will use this important information, presented in a conceptual framework and through case studies for exploring representative problems, identifying and implementing appropriate methods of measurement and analysis, understanding examples of policy applications, and gaining valuable insight into the multidisciplinary requirements of successful implementation. This book provides core information in a format that provides not only the concept behind the method, but real-world applications giving the reader valuable, practical knowledge. Food scientists and nutritionists, consultants, professionals and advanced students involved in the development and implementation of successful policies and programs for addressing the concerns of adequate food supply to the world. This extends from those scientists evaluating new crop breeding techniques to governmental officials charged with implementing official anti-hunger/health promotion programs.